Following the Reader: The Versatile Blogger Award! 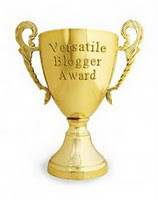 The very lovely Kristin at Growing Up YA has just awarded me the Versatile Blogger Award! Thanks so much Kristin! 2. I have (probably an unhealthy) obsession with Pinterest. But it just has everything I never knew I always wanted or always wanted to do! 3. I don't particularly like airports. Ok I hate them, I really really do! Which is going to make number 4 very interesting..
5. I love Modern Family. One of the best shows to sit down and watch and not have to think about. Don't ask me to choose a favourite character though, it changes nearly every episode! 6. I buy books when they are first released because I need them right then and there, but I won't actually get around to reading them for ages! 7. I usually like to buy my books, but since becoming a book blogger I just can't afford to buy every book I want. I have been making great use of my library, I visit frequently and borrow more than I can read sometimes. It's like going on a book buying binge but without any money being spent! Now for the 5 bloggers I would like to pass the award on to! Taneika @ Flipping Through the Pages: One of my first blogging friends, who lives in WA, just like me! One of these days we will actually meet, hopefully in a bookstore! Sophie @ Born to Buy: She isn't a book blogger, but she is a dedicated beauty blogger with lots of great reviews! Farah and Juhina @ Maji Bookshelf: These ladies have a lovely blog! With some really great reviews up! I'm going on a huge trip to Europe this year! I'll have plenty of advice if you need it. :) I don't mind airports, but I hate flying! That's why I'm cruising over. :) I have to fly back, though. Ick. Modern Family is my FAVORITE show! Oh my, I die of laughter. Ditto on your #6. I do that ALL the time. Having trouble with the library... the books are all dirty and beat up! Haha. So fun getting to know you! We have so much in common! Modern Family is comic genius. Seriously. I just can't get enough. Each character is so different and hilarious that picking a favourite is so hard! AWWW THANKS :D YAY FOR WA! Thankyou so much for mentioning me :) I am a hugeeee Disney fan (like, majorly) and I have Pinterest but I forgot my username :| I'll figure it out and try to find you!! I'm super jealous that you're going to Europe. Seriously. REALLY JEALOUS. Haha! I haven't been on a plane since I was like, 2 though! We will have to sort out a secret code or something like in spy movies!! Of course meeting in the YA section of a book store Person 1: "What do you think of Taryn Browning?" Person 2: "The Dark Seeker is one to be feared." OR I supposed you could take the easy approach. Me: "Taneika?" You: "Yes!" haha.. when you find your username LINK ME!! We haven't booked Europe yet but I really really want to go! I never really travelled much before this either. Ahahahaha! Secret code would be amazing! I definitely think we should act like bookstore spies, that sounds much more fun ahah! I agree, that does sound fun! I knoww I'm so excited!! I've been to QLD (by plane. You went by car? :| how long did it take??!) And Tasmania. The only place outside of Aus I have been is Bali! Same!! I feel like they are watching my every move and security freaks me out too, especially when they want to bomb test my bag and stuff. I always freak like somehow just randomly came in contact with one somewhere in my lifetime? Make me so nervous even though I haven't done anything wrong. I REALLY WANT TO READ THAT!!! This book buying ban is torture!! Unhealthy obsession with Pinterest?? CHECK! And Europe??!!! I LOVE LOVE LOVE!!! What countries are you visiting? #6 is pretty much the story of my life btw. My bookshelves have reached a whole new level of ridiculous. Wayy to much time spent on Pinterest!! Like I have to get my daily Pinterest quota in before bed or I start havig withdrawal symptoms or something! We haven't officially decided what we are doing for Europe but I will of course let you know when we make a plan and book! But hopefully we will be going all over! My bookshelf has gotten pretty ridiculous too. Though heaps of my books arent on my shelf anyway since I leant them out! Can't imagine what it would look like with every book on it! you're welcome! Modern Family is just the best. You love airports?? haha!